It's sea-turtle nesting season again in Florida, a global hotspot for rookeries. Several species haul themselves onto the Sunshine State's white beaches in summer to lay the next generation. Foremost among them is the endangered loggerhead sea turtle – the southeastern United States, and Florida in particular, serves as its most significant nesting stronghold. Of course, sea-turtle nesting season means sea-turtle eating season for some terrestrial predators. And officials at a county park on an offshore islet in Florida recently noticed an unexpected visitor at the loggerhead nesting grounds. Jim Wilson, park supervisor at Fort De Soto Park, spooked a coyote on Mullet Key earlier this month and discovered that the canine had gobbled eight eggs from the beach nest of a loggerhead sea turtle. In decades of work at the park, which lies at the entrance of Tampa Bay, Wilson had never before documented a case of coyote theft at a sea-turtle nest. Given turtle hatchlings will start emerging from local nests in the coming weeks, he's leery of the coyote's appearance. "We don't want him getting a taste for eggs," he told ABC Action News. "[Coyotes] are more a nuisance at hatching than they are at nesting. Nests are going to start hatching up in the next week or two. So we not only want to protect the new eggs coming in but also the hatchlings coming out, and our shorebirds are in the same situation." Wilson suspects the coyote accessed the Fort De Soto beaches via bridges from Tierra Verde, an island closer to the mainland. The coyote Wilson nudged off the loggerhead nest (which, he acknowledged, "was doing what coyotes do") hasn't been seen since, and it's certainly possible its Mullet Key raid was a one-time shot. The park is asking campers and beachgoers in Fort De Soto to report any sightings of coyotes or their tracks. 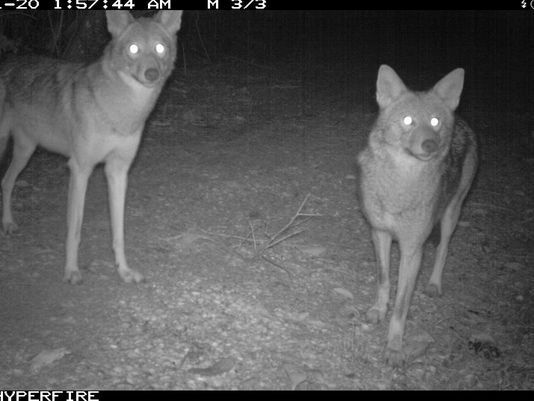 Should the canid return, park officials may try to trap and relocate it. Fort De Soto lies in Pinellas County, one of the most significant beachfronts for nesting loggerheads on Florida's Gulf coast. Last year, the county hosted nearly 500 loggerhead nests, according to a survey by the Florida Wildlife Commission. Female loggerheads typically deposit around 100 eggs at a time, and lay several nests a year. Coyotes are known to dig up sea-turtle nests along the southeastern coast of the United States, but the phenomenon is only a few decades old. That's because these carnivores colonised most of eastern North America only in the mid- to late 20th century from historical haunts out west. They first appeared in the Sunshine State in the 1980s, according to biologist Gerry Parker's Eastern Coyote: The Story of Its Success. A study at the Tom Yawkey Wildlife Center in South Carolina showed that coyotes can have a significant impact on sea-turtle nests in some places. The canids were first recorded here in 2006, and three years later they accounted for more than half of the total seasonal loggerhead egg loss, preying on clutches mostly the same night they were laid. After-hours patrols, and later trapping and removal, helped to address the coyote problem in the refuge (which has also seen nests pillaged by feral hogs). Meanwhile, people monitoring sea-turtle nests all along Florida's Gulf coast – including on offshore beaches along St. George, Gasparilla, Sanibel and other barrier islands – are getting used to coyotes joining raccoons, ghost crabs and other members of the local egg-and-hatchling predator roster. Coyotes might as well be the definition of an opportunistic forager, and it's no surprise those adapting to the subtropical shores of the American Southeast are noshing turtle eggs and hatchlings when they happen upon them. On Mexico's Baja Peninsula – longtime coyote country – the "song dogs" excavate the nests of olive ridley sea turtles as part of a diet rich in marine resources, which is understandable given the peninsula's desert interior and the comparative richness of its seacoast. Researchers in one study of sea-turtle nest predation in far southwestern Baja suspected coyotes made opportunistic coastal rounds that sometimes happened to include egg-eating. "Our hypothesis is that coyotes are not specifically looking for sea turtle nests," they wrote, "but when they come across turtle tracks, they follow the tracks, dig [up] and consume the eggs." Meanwhile, Florida beachgoers of the two-legged type can do a lot to minimise their own impact on nesting sea turtles and hatchlings alike this time of year. Check out these tips from the Clearwater Marine Aquarium (which annually monitors sea-turtle nests along the Pinellas County coast to the north of Fort De Soto). Turtle-friendly beach etiquette this time of year, for example, includes knocking down those sand castles when you're done with them, given the topographic obstacle they pose to a tiny flippered newborn burning rubber for the brine. A coyote got a bit too close to its bear neighbours during a recent scavenger fest in Los Angeles County. Even for the biggest land animal in North America, life can start out on the perilous side of things. In murky ponds, as in life, there's always a bigger fish angling for a chance at your hard-earned bounty.